Service is wonderful, Crystal, Rhonda and Steve are very helpful. Good Service! Nice place to store your stuff with friendly staff. Have and will recommend to friends looking for a storage unit. Nice place to store with friendly staff..
Neat and clean Thank you. Nice place went in to rent a u-haul and got a 5x10 unit as well. Staff is so kind and helpful glad we are renting here. Friendly helpful staff &would highly refer them to a friend! Crystal was so helpful she found me the right size unit at a reasonable price. It’s clean inside and out. I will definitely recommend my friends here if there ever looking for storage. They were so helpful during our move. The U-Haul tuck was also a huge help for us. Thanks so much!! 5 stars all the way!! Great location!! Great location. Friendly staff. Had a great experience here. Would recommend this place to anyone!! Very nice owners, very clean facility, easy to get to. Just wish hours would be 24/7, because I sleep most days and am awake during the night...but based on the overall operation, it is acceptable!! Website was not user friendly. Very helpful for my first time to ever rent a storage unit and was very pleased. Facility is well taken of, Office staff is very friendly and knowledgeable. I would recommend this place to anyone looking for a great place to store there items. Kirstin has been nothing but amazing Thank you for all your help and always being so friendly..
Steve went above and beyond to make sure we were taken care of. Staff is helpfull. Kirstin is Wonderful! Kirstin was so kind and helpful-Thank you! Customer service is awesome and very professional. Kirstin was awesome! So helpful and friendly. Thank you! 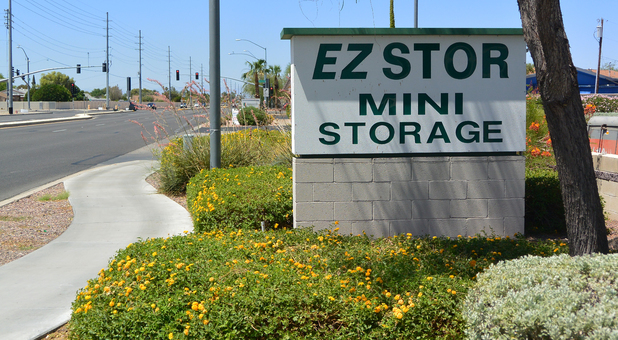 Im happy with the service at ez storage. I recommend it. Resemble prices and clean nice service with the customers. Kirstin was so helpful!! Glad with our choice! Staff is great, very helpful! Kirstin is so kind, ALWAYS smiling. Kirstin is awesome, great help! I will refer everyone to this storage. Great place! Kirstin helped me and was patient while I figured out size I needed and truck rental. Kirstin is so helpful and courteous!! Kirstin is a very friendly and courteous. Absolutely would rent again. The staff was very professional and the office and storage area were great. Very pleased with your service and facility. This has been my third time using EZ STOR. Completely satisfied and needed in the future my choice is EZ STOR. Great Service. Especially thoughtful with locks available! Staff excellent, thank you "Kirstin". Quick service and courteous. Staff and Service are a 6 in my book!!! Lady in the front office, very pleasant. Front office staff very helpful. Facility is wonderful and such wonderful people working in the front office. Kirstin helped me with everything. The staff here is amazingly friendly. Sherri is very helpful, took care of all our needs. Sherri provided us with excellent customer service. She stayed after hours to switch us to a larger storage unit. She is helpful and friendly. Everything & everyone was wonderful! I highly recommend EZ Stor Mini Storage! Your man here, Steve Apel, Was most helpful and courteous. Everything you would want in a storage facility. Friendly and helpful staff sold me. Very good service and clean. Would like previous activity in 'my account' and the upcoming bill and due date listed there also. The workers here at EZ STOR are wonderful people they are very helpful and they work with there renters. EzStor has been very good to me and my mom ! I would rent from ez stor in the future. On my Top 3 most customer friendly companies I have Ever Dealt with and would defiantly recommend to anyone and everyone. Alex is so helpful, Easy to understand and patient, I really appreciate the excellent customer service he provides as well as the low prices, convenience , responsiveness and safety. Great Deal, Friendly staff, and love the free move-in!!!! I've had a 5x10 unit for 2 months. The manager was super nice. The paperwork process was fast. Nice clean facility, friendly managers.